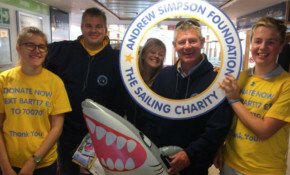 Tidal conditions meant cadets from Brading Haven Yacht Club couldn't take part in last weekend’s worldwide ‘Bart’s Bash’ sailing event so they took to the Red Funnel ferry to help to spread the message about the Andrew Simpson Foundation and raise funds at the same time. The closure, 24 hours earlier than expected by residents and business, created "mayhem" one driver told OnTheWight. Police are appealing for witnesses following a fatal collision on the Isle of Wight last night, which tragically took the life of a 20 year old man. Brading High Street is to be improved in an overnight resurfacing scheme next month between New Road and Coach Lane. Stacey Kettner will be holding a Life of Brian ‘Beardfest’ event on 14th July at Brading Roman Villa to raise money for the British Heart Foundation. Get your tickets (and beards) now. Residents are invited next week to have a look around the Brading Youth Centre and meet the team to find out what's planned in the coming months. Have you seen this missing foster dog? She escaped at 2am this morning and was last seen running towards The Mall in Brading. She's apparently very frightened of humans. Their two dogs had undergone such long-term neglect that RSPCA inspectors could not make out their facial features. The Toogoods were sentenced this week. There has been a huge outpouring of condolences on social media for this much-loved Islander who sadly passed away this morning, following a road traffic incident in Brading on Wednesday evening. The group campaigning to keep Island Line within the wider franchise is urging the new rail minister, Paul Maynard, to ensure the Isle of Wight is treated equitably. Your chance to see Britain's Got Talent's Boogie Storm at this new event organised by Isle of Wight charity, Daisy Chains IW.